"After Katrina and 3.11: Representation, Politics, Culture"
Experts discuss the Katrina disaster in New Orleans and some of the ways in which Katrina research could prove useful for Japan. Symposium on 3/11 and Katrina: When Japan was hit by an earthquake and devastating tsunami last year, people all over the world looked on in horror. But for people in New Orleans, the pictures from Japan must have felt like deja vu of their own disaster, Hurricane Katrina, which flooded the entire city back in 2005. The Saturday session will also offer simultaneous Japanese translation. All events are free and open to the public. Tokyo Professionals Business Networking event on Tuesday, May 29 at the Strings Intercontinental Hotel in Shinagawa. This is sure to be a great networking opportunity, hope you can attend. http://tokyoprofessionals.net/ When you RSVP, indicate the industry you are working in. Also let us know what industry you would like to make connections with. We will try to get you in front of the people you want to connect with to make your networking experience more productive. Admission is ¥2000. Entry fee includes one complimentary cocktail or soft drink. Guests are entered into a prize give-away. Prizes are announced during the event. A cash bar is available. We welcome you to join us for a great night of networking. Please click here to RSVP. my workshops start in 10 days! 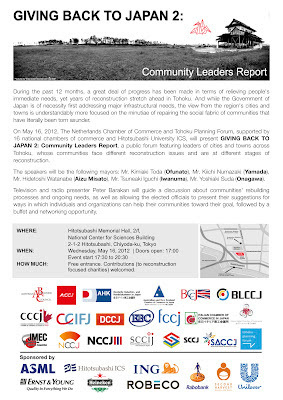 UNU report on TohokuJapan-UNESCO/UNU Symposium on The Great East Japan Tsunami on 11 March 2011 and Tsunami Warning Systems; 16-17 February 2012; Symposium Statement and ProceedingsThe symposium proceedings (130 Mbytes) can be downloaded as one file from http://ioc-tsunami.org/tohokusymposium . The individual documents from the symposium can also be downloaded from the same web-site. Change.orgis an open platform where anyone, anywhere can start, join, and win campaigns for social change. You can think of it as the YouTube of online campaigning.You can learn more from arecent Guardian profile, this clip onThe Daily Showand the CEO's profilein theTIME100. They are expanding to Japan and are hiring! The application deadline for both of these positions is May 30th, 2012. Give2Asia networks philanthropy together with Asia's incredibly diverse community of nonprofits, social entrepreneurs and charitable institutions. Our 2011 Annual Report, which is now available online, captures this diversity and the engagement of international donors seeking to improve life in Asia. Corporations, individual donors, wealth advisors, grantees, beneficiaries and partners all express how strengthening charitable organizations has had an impact both on targeted communities and their own role in the world. We encourage you to review our annual report, which highlights our impact during past year in education, health and disaster response throughout the Asia-Pacific region. You can read our full Annual Report by clicking here.